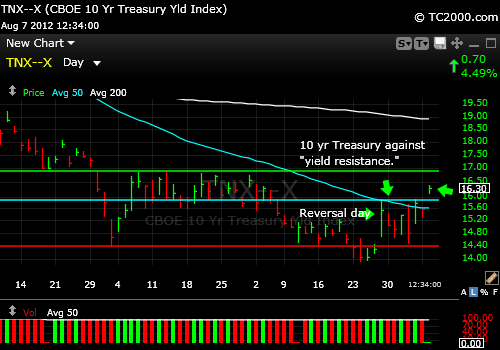 ← Market Timing Brief™ for 07-27-2012: Bonds. Treasury Bonds. The rally resumed once it was clear that Spain would be receiving all the free money they need from the European Central Bank. The VIX volatility index plunged to just above the July low on Friday. It can still drop to the March 2012 low. The US dollar (USDX, UUP,EUR/USD) is weakening, but must break 82.34 to change the trend definitively. The reason the 10 year Note is so important is that the world must signal that the fear of the destruction of the Euro has faded away before it will invest elsewhere, specifically in the US stock market. The US dollar should drop as the 10 year Note. Other bond markets should begin to sell off as well. Otherwise, stocks will tip down again. The NASDAQ 100 is back in action due to Apple’s better performance over the past week (AAPL). It is a buy at the moment (QQQ). Commodities could begin to move again after some consolidation. Oil has some technical tone now and looks like it’s leaning up. Housing had been pulling back. Now it’s rising again (HGX, ITB). That is a bullish sign for the overall market. It’s good to have some indices with room to rise to the prior highs. The money printing press is expected to run in Europe with the US as the backup, but if Europe does not follow through on its promises, the markets show their displeasure. This entry was posted in Euro, gold, gold etf, investment, Market timing, S&P 500 Index, trading, Treasuries, US Dollar Index, volatility index and tagged eur/usd, gld, gold etf, market timing, qqq, sp500 index, spx, spy, tnx, uup. Bookmark the permalink.